The father had terror in his eyes, a look that said, “Some university just cashed the largest check I ever wrote,” while the prospective freshman had that“How much longer until I’m away from here” look. All this is history for our family. The trip to sophomore year was much easier than the first trip. Last August the stress in our house was palpable. Our son worried about everything as he prepared to enter college. Freshman year, we arrived at our son’s new home, an eight-story dormitory. Legions of buxom, scantily-clad sorority girls met us with carts at the front door. Friendly, helpful girls in tiny shorts and halter-tops made nice to my son and husband — then loaded my son’s belongings onto carts and helped us to the sixth floor. No stress. No heavy lifting. With his own final exams, my college-teaching husband could not go along to pick up our son at the end of the spring semester. I soloed. No chesty helpers this time; the school had cashed our checks by then. Only one rickety cart was available for all students moving out of this eight-story dormitory. We brought everything down from the sixth floor in elevator loads, but waited 45 minutes for the cart to bring down the heavy TV. His TV was a tube set with an integrated DVD player. He was thrilled when he received this as a sixteenth birthday gift. He was not as thrilled about this gift when his asthmatic, heavy-breathing, hot-flashing, cranky mother balanced the bulky object on the cart, covered it with garbage bags, and slid haphazardly down the treacherous entrance ramp in the rain to the rented van. Others in line for the sole cart gazed on us in disregard as we struggled past. This year his roommate is bringing a 19-inch LCD TV. God bless his roommate. Freshman year, we arrived just as our son’s roommate and parents did. We’d met the roommate and parents earlier in the summer at orientation. Ever meet someone and felt the vibe that they cannot stand the sight of you? That is the feeling we sensed when we met the roommate’s mother at orientation. The four parents and the matriculates ran into each other several times during orientation. After the initial small talk, the parents seemed to avoid us. 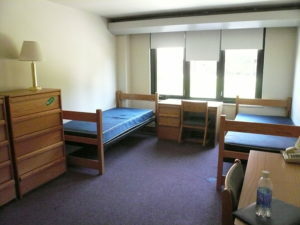 All six of us arrived in Room 621 at exactly the same moment on move-in day. The tiny, square room was jammed with overflowing boxes, electronic gadgets and cords, suitcases, and clothing. My husband and I looked at each other, with that peculiar telepathy long-term married people share: Get me the heck outta Dodge while there is still time. We had not arranged our son’s things since he was about six. We did not plan on arranging his college dorm room. Nor was he interested in our comments or our arranging. We saw that as reasonable parenting. Our son had a pained look on his face and spent the next two or three hours with his roommate and roommate’s parents, the exacting “organized” mother and beleaguered father. Meanwhile, we went to an art museum to ponder the works of Jacob Lawrence. Yes, we threw our son under the bus. We came back after the “arranging” was all over. If an 18-year-old is smart enough to get into college, he can certainly calculate if the microwave/refrigerator combo should be under the cable TV hookup. If your student can’t do that by now, there are much graver problems. How things have changed since I started Old State University in the fall of 1975. My parents, brother, and I packed the 1973 Impala sedan and drove two hours south from my hometown. I bit my cuticles bloody, probably just as nervous as my own son was on his first trip to college. I convinced my father that I knew exactly how to get to my dorm 90 miles from home. In truth, I did not know anything, and we found ourselves in a subdivision where you could at least see the campus behind a high chain-link fence. An awful moment — as if I was seeing the glittering spires of Oz from inside Folsom Prison — freedom just beyond the fence. When we finally arrived at my dorm, my room assignment was on the fourth floor. There was no elevator. My electronic equipment was a wind-up alarm clock, a Smith-Corona electric typewriter, and a Close-n-Play one-piece stereo. No iPod. No television. Not a single lux-u-ry. Had I owned a television, there was no reception on that side of the building. Indianapolis, the nearest metropolis, had four television channels, five on a clear day, but my side of the building faced away from the signals. Lucky for me, I was entertained all year by blasts of Aerosmith’s “Walk This Way” and “Big Ten Inch Record” from the neighboring boys’ dorm. After unpacking numerous pairs of painter’s pants, blue jeans, and T-shirts so the suitcases could return home with my parents, it was time to say goodbye. I watched them drive away and then immediately went to the basement of the dorm and bought a pack of cigarettes. Not knowing anything about smoking, I bought non-filtered Camels. Does every freshman in college do this? I had just three or four hours to learn smoking, so I could convince my floor-mates that I was as cool as Bette Davis or Joan Crawford in the old movies. Even with my rhinestone cigarette holder, cool was not in the equation. Choking, hacking, vomiting, maybe; but, cool, no. Many friends, relatives, and neighbors send children off to college every fall for the first time. The separation is not easy on parents. I cried my eyes out through most of Team of Rivals, the audio book we bought for the drive home from our son’s freshman trip to college. I’m sure I will cry again when we leave him this year. The separation never gets any easier. Published August 16, 2013 at The Broad Side and in A Piece of Her Mind (2013) available on Amazon.com. Life is Fragile: Handle it with Prayer Is Friendship For Life?